There's not much happening lately so here's a photo of a forgotten old sticker I stuck as child on my parent's side bed frame. This was the age where we liked to hide under the bed to play hide-and-seek (with no one in particular) and I used to roll off my parent's bed while napping and hit my head quite painfully on the floor, so probably 3 to 5 years old. My mom shifted her bed in a different direction lately and the usually inner side was facing outwards for the first time in eons so I was astonished to find this THING still there. Thought we changed the bed frames when we moved home, so apparently they're still using the same ones (we changed the mattresses only). It was a nice feeling of nostalgia. I doubt my parents ever noticed it because we weren't allowed to paste rubbish around, not least on their furniture lol. As you can see my skill in welding the scissors is quite pathetic but it's funny I remember being frustrated at cutting out that blank space in between the legs without affecting the feet and it was impossible because I couldn't even handle the outer curves without mangling the sticker. He appears to be Roger Hargreaves' Mr. Happy doesn't he? Except he's not smiling because I snipped off his left leg and made him polygonal. Its not something we were encouraged either but in a moment of madness one of us would do something crazy like this :).... after all we are only children. 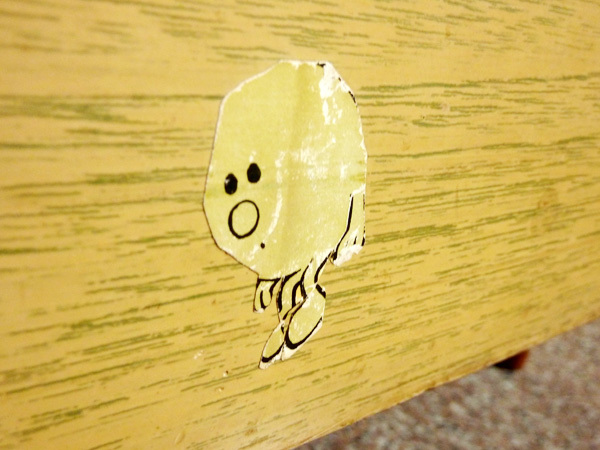 Adorable story behind this little sticker.